Lets take the time warp back to 2004 & the release of the Medion 250 Pocket Pc based in-car GPS Navigation system. I've seen some of these systems in e-bay, so lets look back and see if this Gps device is still relevant today. 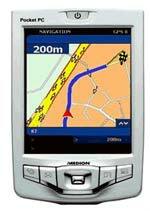 The Medion 250 was the first Sat Nav that I ever used, & I remember being amazed as it guided me around South-London. For its time the Medion 250 was very well specified, with a powerful pocket pc, seperate GPS receiver, power leads (home & car), docking station, and discs for Western Europe. The navigation view was top-down, with only partial Post-Code look-up, & it wasn't the easiest piece of Software to use, but once you used it a few times it was ok & accurate. The Pocket Pc side of things was good for the time, 65k screen, 256mb Sd card, infrared port, & all the usual applications like Pocket Word, Excel, etc. A good little machine. Would I use the Medion 250 now? No. The maps are too old, & the software not good enough. What I would do if I could get one cheap enough would be to load up Tom Tom Navigator for the Pocket Pc, & use that instead. i am having a few problems my battery went down and i lost my sat nav i dont have any of the software for it and cant find any where i really need it as plays big part in my living.